SARASOTA COUNTY ⎯ Got bikes? It's the perfect weather to grab your whole family and join Sarasota County Parks, Recreation and Natural Resources and Carlton Reserve volunteer guides, David Reynolds and Gary Vasbinder, for an off-road wilderness bicycle ride through the beautiful T. Mabry Carlton Jr. Memorial Reserve (Carlton Reserve). Ride time will be approximately 1 to 2 hours. Expect to see a lot of wildlife! Contact David Reynolds at 941-412-5575 or Gary Vasbinder at 941-893-7729 to register for this free event and for meeting location. For more information, call the Sarasota County Contact Center at 941-861-5000, or visit www.scgov.net. Also see Calendar page on this site. Click here to see plans for the bike connector between North Port and the Legacy Trail with Carlton Reserve spur. Check out Steve Christian's latest proposal for the Churchill tract. Get Updates on current and proposed single track biking in the Carlton and connecting lands. Click Bike Venice Florida for great regional biking information! SCORR's "Guest Rider Program" was in session today at the Carlton Reserve. 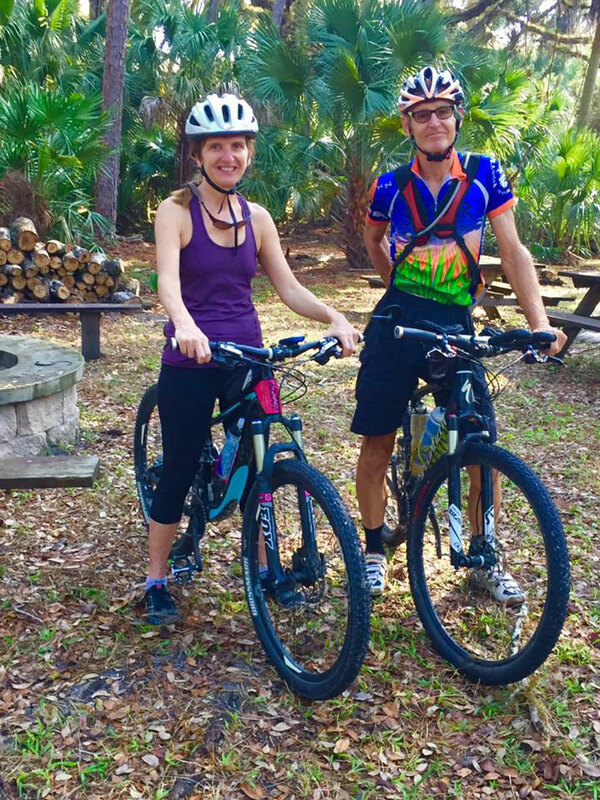 Brooke Langston, Sarasota County Natural Parks, Preserves and Trails supervisor accompanied Linda Kaeslin Christian and I on a ride that included the Red Trail, South Powerline, the Jordyn Parcel and a taste of Boldlygo. BIKE VENICE FLORIDA website has a wealth of information regarding area biking and plans for the future, including the North Port Connector that would link the Carlton to Myakkahatchee Creek Preserve and other adjacent natural lands. a not for profit corp.